I always struggle with my salutation...anyone else? Today's card came together with the help of three challenges. 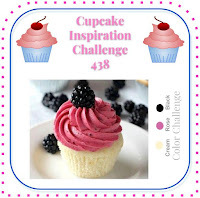 The colors from Cupcake Inspirations #438 (Rose, Cream, Black); Penny Black Saturday Challenge for January -Anything Goes using Penny Black image; and Inspired by all the little things 78 Photo Inspiration. My colors are from the cardstock with tone on tone embossing, the flower outline and the Copic on vellum coloring. The flower image is from Penny Black's Delightful, I cut out only a small portion of the image once it was stamped and heat embossed. My card shape and the lattice clear embossing was inspired by the photo inspiration at Inspired by all the little things. I took some time today to play, no challenges just playing. I need 32 Valentines, so I played with a few things, and I have half of them done! My first time playing with alcohol inks and yupo paper, those background are definitely fun. If it wasn't for my misti, this card would have driven me nuts. I actually used the Mini Misti, which I have been treating like the also-ran to the original sized one. But today, I finally got comfortable with it and I am loving it's compact size. I had to play with those little envelopes again, they were still sitting on my desk. It has been a good week as far as playing in challenges. One more today - a one layer cute birthday card that'll play in two challenges. 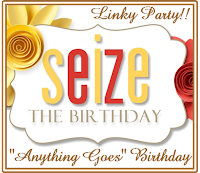 One Layer is the topping at Seize the Birthday, and Cute is the one layer card prompt at Less is More this go round. I had to alter the balloon, it was originally heart shaped, but I wanted more of a birthday feel than a Valentine feel, so I drew in a line to cleave the heart and added a balloon in the back and colored each one a bit darker than the front balloon which is fully outlined. I've also taken to coloring my image while it sits in the misti, so I can just stamp it again at the end to get nice dark crisp outlines. I love these sweet lil penguins from Gerda Steiner. I ordered the set in December, hoping I'd be able to play while in California...but it saw no ink until today. Here is a card for Addicted to Stamps - anything goes and Case this Sketch 256. I pulled out an old favorite stamp set Sending Happy Thoughts from Simon Says Stamp. This card can go anytime and it could be masculine or if I run out of Valentines it can even fill in there. Now that's a versatile card! 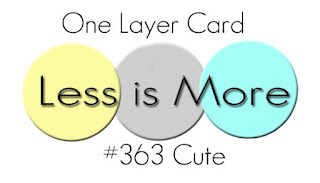 Edited to add: I am also submitting to Simon Says Stamp's Wednesday Challenge - Layer it Up, there are actual layers and a virtual layer of envelopes on this one. Sunny Day Crafting is another new to me challenge blog, and you know I cannot resist a flower challenge. 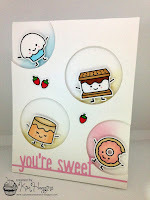 Along with Sunny Day D is for Daisy, this card is also visiting Simon Says Stamp's Wednesday challenge Layer it up. The Daisy is from Hero Arts, embossed in white. The sentiment is from Simon Says Stamp. I just went through my calendar and updated my birthday list. 68 is the number of birthday cards this year so far that will need to be made. 15 of them man cards...yikes, but happily 53 are girly cards yea! My January ones are done and in the mail so this will go into the stash for one of my yellow loving friends. 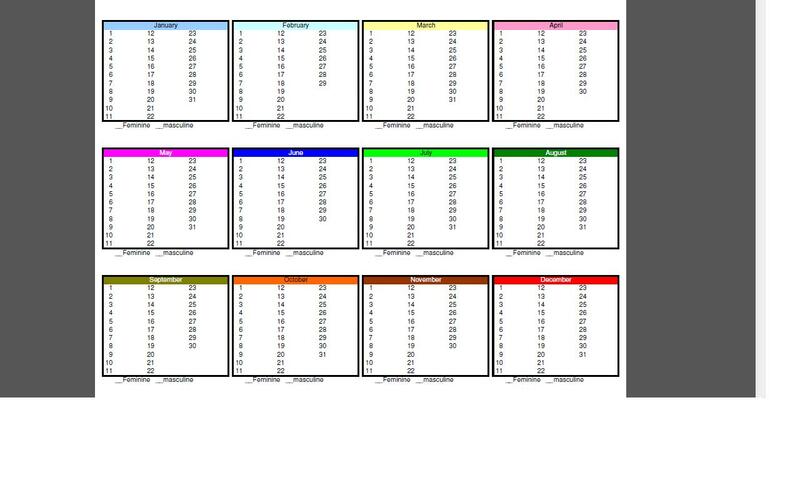 I keep track by using a perpetual calendar I created in excel. I update it on the computer each year, and hand write things in during the year on the printed copy I keep in my planner. I cut it into strips, so I am only looking at 4 months at a time. How do you all pick your challenges to play in...well other than those on design teams...but which ones voluntarily? 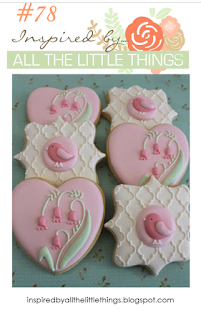 I follow about 168 blogs and most mornings post breakfast, I scroll through my bloglovin feed and save to my tool bar the ones I think I might want to play in along with the due date in the title of the bookmark. City Crafter Challenge is Balloons, Freshly Made sketches has a darling one by Jen, Color Throwdown's colors are Aqua, Orange and Gray and perfect for some papers in my stash, and Shopping our Stash has Birthday as the theme. Icons for each of the challenges are below. Its simple, and with the multi colored balloons festive and its going in the mail tomorrow! I am determined to get at least 5 Christmas cards made each month so I am not so slammed at the end of the year with Halloween, Thanksgiving, and Christmas cards with barely a breath before the Valentines are due. I have two cards for four challenges, two each. Chriss' repeated stamps inspired my card along with the snow element from Merry Monday. 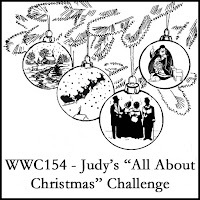 My second card is inspired by Watercooler Wednesday - All about Christmas, and The Merry Christmas Challenge anything goes + Christmas with optional element Ornament- both are new challenges to me. I still had Altenew's Halftone Hearts on my desk, and picked them up again. I'm starting on those Valentines. It's Monday and here in my home that is Laundry day and a perfect time to make a few cards. and followed the sketch from Case this Sketch 255.
and the second card goes to Case this sketch as well. I love these colors, they take me back to my wedding day. Well its been awhile since I colored a non-holiday flower and I absolutely had to get some blooms out. The colors for Color Throw Down 476 are Kraft, Blue and White. I do like coloring with pencils on darker cardstocks and that was the basis for the card. I recently reorg organized my stamps in their bins. I am still very happy with the bins, and zip bags I have used for the last 3 years. Last spring I purchased plastic dividers meant for comic book storage. My zip bags are about 9 inches long, and the dividers are 10.5 so they pop up nicely. 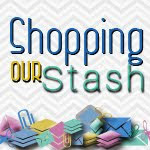 I keep my stamps in bins- (Florals, Holiday, Sentiments, Backgrounds, Critters, and Other.) I finally put those dividers in each bin to separate each stamp set by manufacturer. As I did this I ran across two of my favorite Christmas stamps and thought they'd work well for this challenge. Merry Monday's prompt for challenge 273 was to use red and turquoise. This is such a fabulous combination I was happy to play along. I heat embossed the images and used Arteza brush pens for the coloring. They are strikingly similar to the zigs, and I got a great deal on amazon - 48 for $24.00 in a flash sale. They have a thicker/sturdier brush tip but other than that for me they are just about the same as the zigs. I am back from my visit to my Dad's; and I am so excited to play in a brand new challenge brought to blog-land by the witty and engaging Darnell of djkardkreations. 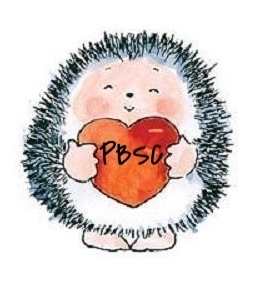 If you have never visited her blog please head over, it will bring a smile to your day. 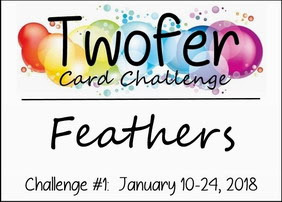 The new challenge blog is called Twofer Card Challenge. The challenge premise involves two cards as the name implies...but here is the twist ... both cards must used the same main image based on the challenge prompt. The cards need to be for two different occasions. How's that for making us all stretch our stamp inventories? I personally think this is a brilliant challenge and I was so hoping to play from California...but I didn't have anything with me that satisfied the prompt. Now that I am home, I have 1 single set to use to play. So on to the challenge! Here are my two cards, as per the rules they must appear together in one photograph. I have one set of feather dies. For the encouragement card, I made it square-- die cut several of the feathers and glued them to the card front. I created the sentiment on my computer (see this post for instructions) and added a few black dots. My second card - a manly birthday card - has gray leaves on a woodgrain embossed card base. Very simple and clean. I made these before I took off for California and meant to include them with my Penguin Day post, but I did not get it done, so here are a few more Penguin cards now that I am back in my crafty space in Maryland. My favorite cards are the just because or unexpected cards. They are wonderful to receive and so many of my non-card making friends back in California have let me know that the unexpected envelope in the mailbox is a definite mood lifter. I know when I get a card from my crafty friends unexpectedly it brings a smile to my face and adds a lil something to the day. I have lots of thinking of you sentiment stamps as well as just because...but I was thinking I needed some inspiration. I kinda stumbled on to this site of Bizzare and Unique Days, and I think there is inspiration there for some cards...and a silly unexpected reason to mail them out. I plan on picking out one day each month making several cards for that day and sending them out. For me this month, its Penguin Awareness Day - I have several penguin stamps and what better way to use them? So, thanks for stopping by; as always your visit is appreciated. I am trying to get used to drawing in some backgrounds for copic colored stamps. I am not an artist, and I am tremendously envious of those who can put images to paper by drawing. I cannot. Last year I watched this video by Sandy Allnock and it is the reason I fell in love with those MFT Polar Pals. This is my case attempt of a similar card. Another bear card for you today. This one is for hubs, he returned to Maryland a week before I did...this should be waiting for him when he arrives. The sentiment is computer generated in word. Make a table, fill it with black and choose white as your font color and type away. I recommend adding more rows and columns than you need so you can choose how far the black extends in all directions. After printing on paper, I glue it to card stock before cutting my final shape. I dug out my MFT Polar Pals stamp set...I just love these bears! They remind me of the coca-cola bears and never fail to make me smile. I had hoped that embossing folder was a bit reminiscent of an igloo. The flower is from Altenew, the sentiment from Simon's. This Amaryllis never made it to the front of a Christmas card, but I think it makes a stunning Christmas thank you. After coloring the image (Penny Black) I cut it out to fit on top of a die cut piece of red vellum. I mounted it on a quilt cut card base and added the sentiment from Simon Says Stamp. I think my friend will enjoy the card as much as I am enjoying her gift. I picked up my copics again, it had been a while since I colored. This stamps set is from CTMH, called Tea-riffic. I have a tea loving friend and she'll appreciate it. Through the holidays I saw so many red and blue combinations and I fell in love with it. I figured that this card would make a good try for those colors. There was no saucer on the stamp image...but I think it needed something to even it out,s o I drew it in ---after all that coloring of the cups fortunately it worked out.